First draw a large oval which will become Bamm-Bamm’s head. Then draw a small curve at the bottom for Bamm-Bamm’s chin. 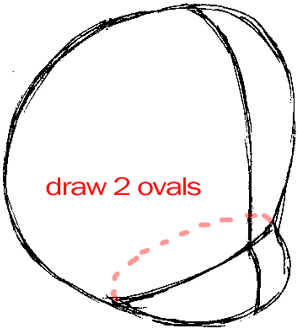 Draw an eggplant shape down the bottom of the oval about the same height as the first oval. This will be Bamm-Bamm’s body. Add two long ovals at either side of the body for the arms, and small circles at the end for the hands. 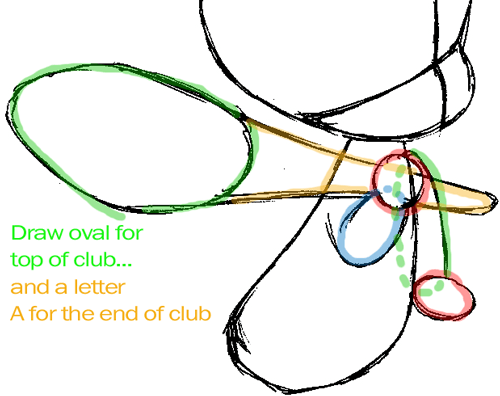 Don’t forget to draw a long funnel shape and top that off with another oval to make Bamm-Bamm’s favorite toy club. 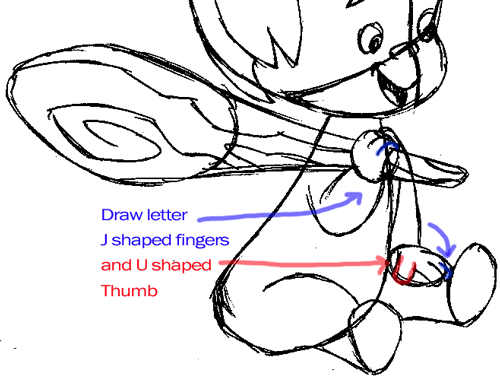 Next draw two small ovals where Bambam’s feet should be, and attach them to the body with thin curved lines. Don’t forget that Bamm-Bamm is a baby, so the legs should not be that long. Next we’ll draw Bambam’s face. Make sure his eyes small and close to his nose. You can give Bamm-Bamm all sorts of expressions here, smiling, frowning or even asleep. Don’t forget to add Bamm-Bamm’s hat. You can draw the hat with a sideways letter ‘S’, a sideways letter ‘J’ for a smile, and the nose a sideways letter ‘c’. Finish up the face and hair. 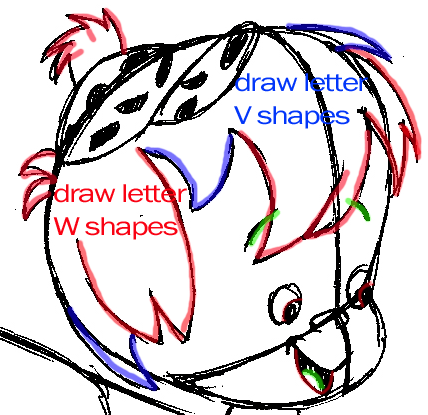 Draw the wispy hair with a combination of letter ‘W’ and letter ‘V’ shapes. 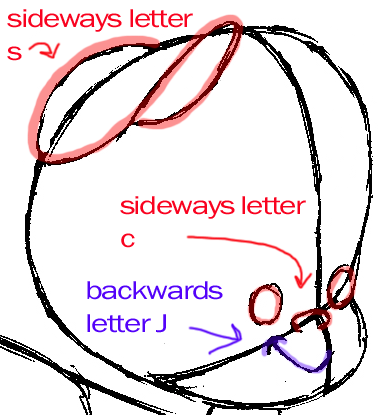 Draw letter ‘c’ shape curves for the pupils of the eyes, tongue, and bottom of his mouth. Also draw the pattern in Bamm-Bamm’s hat. Bamm-Bamm’s club is made of wood, so draw several wavy lines across the club and a spiral around the thick end to make it look wooden. Now we can add Bamm-Bamm’s clothes. 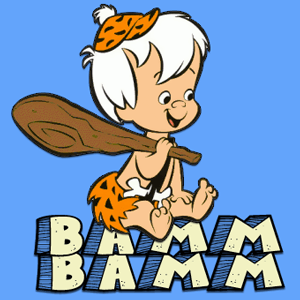 Bamm-Bamm is a cavebaby so he wears a loincloth. Don’t forget to add Bamm-Bamm’s toes! 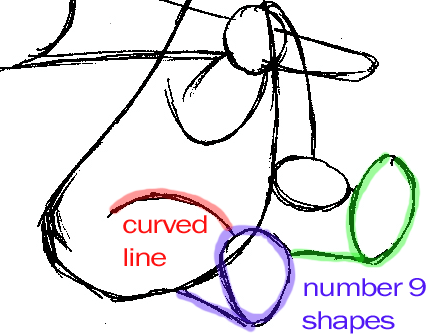 Break more difficult shapes up into simpler shapes, such as letters, numbers, triangles, circles, ovals, etc. Now darken the details and erase the unwanted lines and voila! 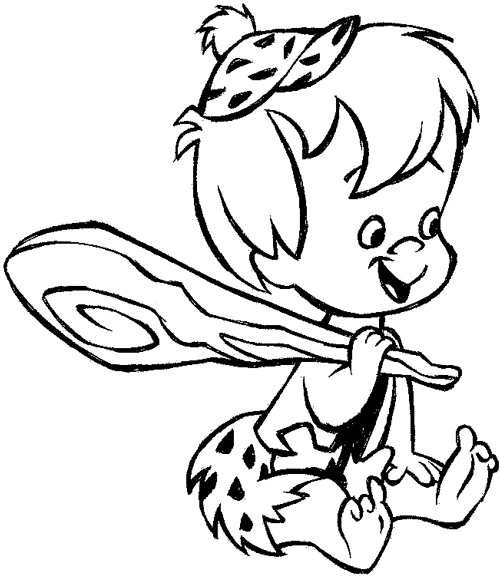 You’ve just drawn Bamm-Bamm Rubble from The Flintstones.